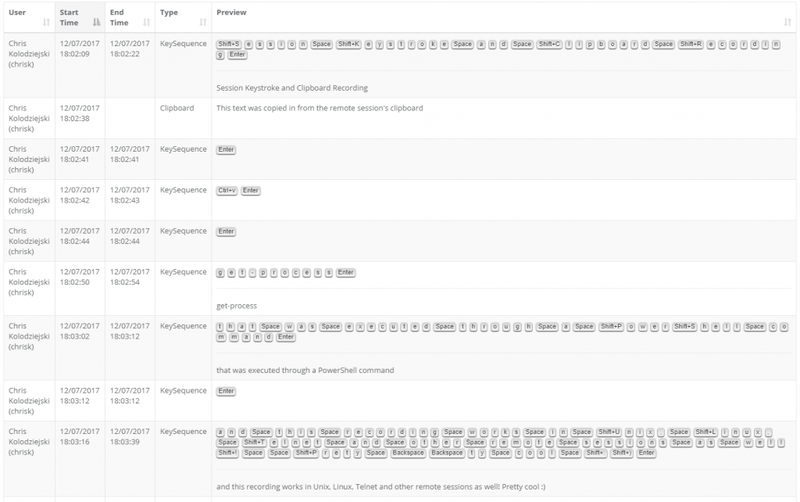 When a user connects to a privileged system using a secure session in XTAM it is also recording the user’s keystrokes as well as any clipboard text copies that are made into the session (video can optionally be recorded too). Keystroke and clipboard event recording is captured regardless of the video recording, so you can be sure that all sessions will have a searchable event report that can be used for investigations. Any user that has the XTAM permission to review Session History and Video recordings will also have access to the Keystroke and Clipboard events as well. Login with a user account that has sufficient permissions and either open a record that you wish to review and open the All Sessions section located in Management > Sessions. From within the Record view, click the Session tab. Locate the Session that you would like to review, open its menu option under the Recording column and select Events. The Session Events view will open displaying all keystroke and clipboard text that were entered during this session. If the session is completed and it was recorded, you can use the Jump to Recording option located in the Action menu to automatically open the in-browser video player and jump to this event.